Deadwood Coach Carries Well-Known Passengers During Attack. NEWPORT, R. I., June 21.—The cottage colony attended the exhibition of the Wild West Show to-day in large numbers. In fact, the exhibition attracted about all of the cottagers, and, socially, Newport was very dull. 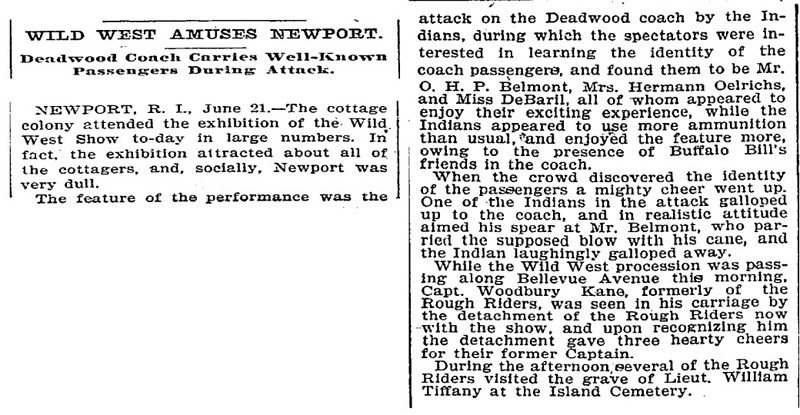 The feature of the performance was the attack on the Deadwood coach by the Indians, during which the spectators were interested in learning the identity of the coach passengers, and found them to be Mr. O. H. P. Belmont, Mrs. Hermann Oelrichs, and Miss DeBaril, all of whom appeared to enjoy their exciting experience, while the Indians appeared to use more ammunition than usual, and enjoyed the feature more, owing to the presence of Buffalo Bill's friends in the coach. When the crowd discovered the identity of the passengers a mighty cheer went up. One of the Indians in the attack galloped up to the coach, and in realistic attitude aimed his spear at Mr. Belmont, who parried the supposed blow with his cane, and the Indian laughingly galloped away. While the Wild West procession was passing along Bellevue Avenue this morning, Capt. Woodbury Kane, formerly of the Rough Riders, was seen in his carriage by the detachment of the Rough Riders now with the show, and upon recognizing him the detachment gave three hearty cheers for their former Captain. During the afternoon, several of the Rough Riders visited the grave of Lieut. William Tiffany at the Island Cemetery.